2019 is Year of Rembrandt, in commemoration of the Dutch master’s death, now 350 years ago. There will be numerous events and exhbitions throughout The Netherlands. You may i.e. visit The Rembrandt House, the painter’s residency and workshop, restored to its 17th Century glory. It’s located in Amsterdam’s beautiful historic city centre. Apart from its art collection, this museum gives an insight in life in the 17th century. Yes, a tourist tip! But let’s not dwell on the topic. Dutch photo- and videographer Gerhard Witteveen made this short video for Royal Talens. It shows the brand’s limited edition Year of Rembrandt artists’ box. Gerhard uses the Cambo Actus-GFX, not only for his photography, but also to add something extra to his videos. Episode Six of our series of tutorials gives an idea what results you can achieve by using a view camera for your video work. The first time Ori Livney approached us, he needed parts for his recently acquired (pre-owned) Cambo view camera. Since that day we’ve been in touch every now and then. One thing soon became clear: Ori never runs out of ideas! Luckily, often well-founded ideas. After getting his degree in Industrial Engineering, Ori worked as a balloon artist for twenty years. He frequently appeared in Israel’s national TV shows and did projects around the globe. Working on the set of a commercial he met Yoram Aschhaim, a successful Israeli photographer. He showed Ori how much better his balloon sculptures could look, when photographed by a pro. It took him about a year of playing around with his camera and strobes to get the desired results. The images helped a lot to grow his business. And then it was time for a new challenge. Freshly-wed Ori asked the jeweller who designed the wedding rings to do a joined project. Lighting balloons isn’t easy, so it couldn’t be too hard to shoot jewellery. Well, how wrong he could be… Photographing jewellery turned out to be very challenging. And that’s what he loves about it. Having no traditional photographic background, Ori felt the need to improve his skills. A lot of techniques can be learned from online tutorials. Photigy and Creative Live were of great help. About the latter: “The classes there are amazing, from photography to retouching and business, every class there is a gem. I highly recommend it!” Starting out in jewellery photography turned out to be “a cool puzzle”. Major challenges were mastering the light, the depth-of-field, positioning the jewelry and post-production. Flaws that aren’t visible to the naked eye, will be in a good photograph and retouching is a must. Like most starting photographers, Ori made his first attempts with a DSLR. The lack of depth-of-field when shooting tiny objects was one of the challenges faced. Ori bought his first view camera – a used Cambo Legend – to get more control over the plane of focus. If the plane of focus is narrow, at least it should be there where you need it. The Legend is a nice view camera, but it was designed for 4×5. Ori soon decided to upgrade to a Cambo Ultima-35 with Mamiya RB lenses. From this range fine lenses can be found at very moderate prices. A couple of the superior Schneider Apo-Digitar macro lenses followed. Even with a view camera that provides the best control over the plane of focus, focus stacking is needed. Very often, the depth-of-field isn’t more than a few millimetres. To make stacking easier, Ori bought a Cognisys Stack Shot kit and attached the complete Ultima to it. The Stack Shot turned out to be a great piece of gear, but there was still room for improvement. To get the best results, it’s crucial to leave the camera in position and move the rear standard instead. Coming from industrial engineering after all, Ori started to design a solution. The Ultima was taken from the focussing rail and the Stack Shot motor – linked by a belt – used to drive the rear standard in small increments. It resulted in a nice stack of focussed shots. The belt had a tendency to slip though. At that time Ori’s dog Kiano had an operation. The poor animal needed a bandage and when looking at it, Ori realized that it would make a perfect drive belt. And it worked! So here we had one of the Ori Livney ideas. It resulted in our mounting bracket for the Cognisys Stack Shot. By then we had replaced the dog’s bandage by a direct drive. Nowadays Ori uses the Stack Shot unit on his Cambo Ultima-35 (upgraded to an Actus-XL) with a Nikon D850 attached. The Schneider Apo-Digitar 120 Macro is his lens of choice. After having honed his skills, Ori started to spread the word and reached out to jewellers. From a home studio he moved his business to Tel Aviv’s jewellery district. Now working in a professional environment and very often shooting at odd angles, a good studio stand was needed. To see more of Ori Livney’s work check out his Instagram account! The rig shown in the picture below is known as the Cambo CS-GH4. The first one was made at a camera man’s request. The quality of the – at that time new – Panasonic GH4 enabled him to leave the bigger gear at home for most of his asignments. To do justice to the Panasonic’s small form factor, a compact rig was needed. It won’t come as a surprise, that the current GH5 and GH5s fit equally well! A unique feature of this rig is the ability to change the position of the padded shoulder support. This enables you to sit the shoulder support on and ‘inline’ with your shoulder, or in a ‘brace’ position pushed against the front of the chest, or positioned over and around your back. The reach of the grip can be adjusted and swivelled into the right position. The camera can be positioned for looking directly through the viewfinder or to give enough room to add the Cambo 3x loupe. The rig is completed with a 0.8kg CS-180 counter weight. Cambo rigs have grooved rods. There’s a small index ball in the GH4/5 rig’s rod connector. By aligning this with one of the grooves, the camera plate will always be in the right position! No fiddly realigning to get the horizon straight. To connect the camera, there’s a choice between standard 1/4 or an Arca style Quick release. Since the very beginning – in 1946 – Cambo have been building studio stands. And many of those early stands are still being used. Often our stands are passed on from one generation to the next! Like the one shown in the photo below. It’s a Cambo AST from the 1950s. Apart from some signs of wear and tear on the surface it’s still in good shape. So it’s safe to say, that a Cambo stand will last a lifetime. And nowadays we can offer a wide range of studio stands, to suit every photographer’s needs. Heights range from 2.10m (7ft) to 3.60m (12ft). Our compact Mono and MBX stands speed up the workflow in many retail studios. The heavy duty UST and UBS support two medium or large format cameras with ease. 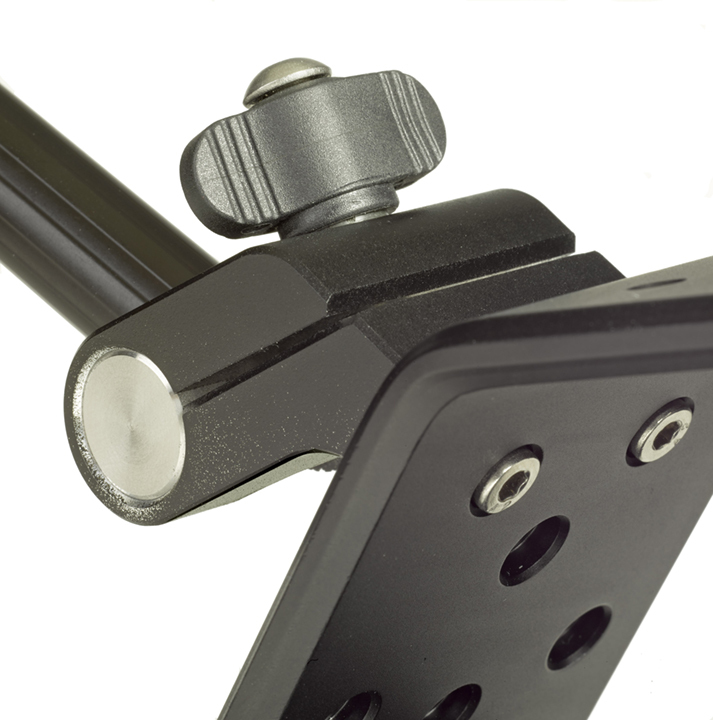 Modern studio stands like UBS and MBX feature cross arms on ball-bearings which rotate independently of vertical adjustments. Amenities photographers in the fifties could only dream of. Since the introduction of the first Actus in 2014 Cambo have added many new versions, accessories and improvements. Based on input by photographers, out of a constant strive for perfection and the necessity to keep it compatible with new camera systems entering the market, like i.e. mirrorless medium format. And every now and then we hear a “I can’t see the forest for the trees” when it comes to choosing the right Actus. Chasing Beauty is the title of Antonio Saba’s latest coffee table book. And beauty is what his work is about. Divided in three chapters – The Memory, The Journey, The Dreamlike – it shows a selection of Antonio’s most significant non-commercial work of the last few years. And as one idea often leads to another, Chasing Beauty was followed by a new project of conceptual photographs: Oneirism. It combines the best Dreamlike shots from Chasing Beauty with new work shot in Sardinia and Bangkok. The Oneirism photographs were first exhibited at the Photographer’s Gallery in River City Bangkok. Antonio met Linda Cheng, the Gallery’s General Manager, when working on a shoot for The Peninsula magazine in Bangkok. The Gallery now represents his work in Thailand. During the last couple of years Asian Culture became a source of inspiration to Antonio. He feels that Bangkok is developing into an interesting hub for art in Southeast Asia. The 25 Oneirism Pictures have been taken on location in Dubai, Bangkok, Costa Rica, Tokyo, Tuscany, Manila, Sardinia, New York, Paris, Beijing and Rome. Being from Italian origin, Antonio Saba nowadays has his base in Dubai. About six years ago, his commercial work first led him there. Now he shoots approximately 40% of his work in the Emirates and the rest worldwide. For him Dubai is the perfect hub, well-connected with the rest of the world and establishing a business there was not only convenient but eventually inspiring and rewarding. As so many photographers, Antonio has a background shooting film view cameras. In 2006 he shifted to DSLR. And felt something was missing. Not only the quality of the lenses and the larger format, but also the ability to control the perspective and plane of focus and – last but not least – the rituals working with a view camera require, which lead to an almost ‘Zen-like’ experience. Martin Wessel-Tolvig of Dubai based HotCold Studio introduced the Cambo WRS system to him. Now Antonio uses Nikon cameras for his lifestyle and handheld work and the Cambo WRS-5000 – with Rodenstock lenses and a Phase One back – for his fine-art photography. The WRS cameras combine essential view camera movements with portability. Paired with the best digital backs and finest lenses, the system enables you to achieve the best possible photographic quality. And at Cambo we’re pleased to know, that one of these cameras is in Antonio’s capable hands!